As you probably have noticed at this point, I have a baking addiction (and admit it loud and clear). Today I was atingle as today marked my first experience making blondies, let alone chickpea blondies. 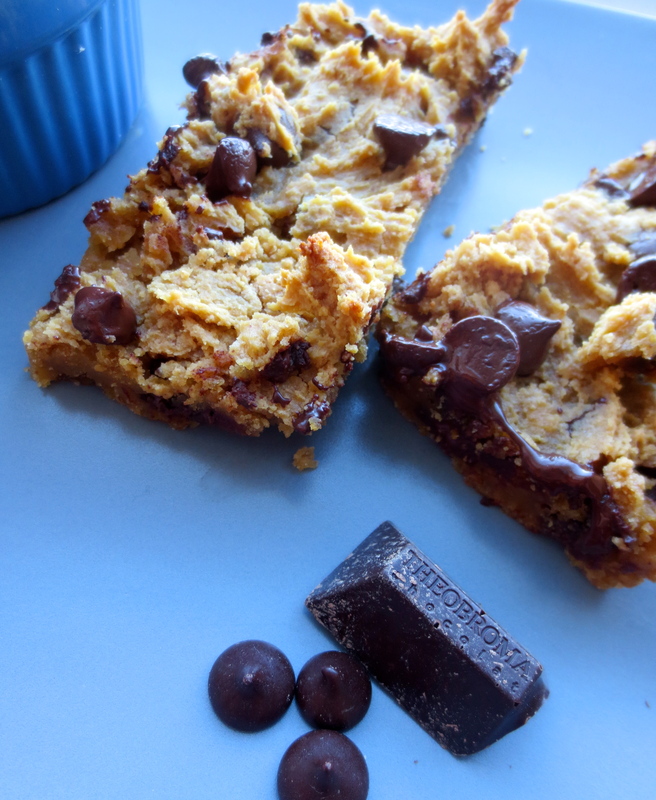 These blondies are extra simple to make plus I solemnly swear they are impossible to mess up (I’m not just saying that…). My beef with regular blondies is that they contain butter, eggs and a crap ton of sugar. 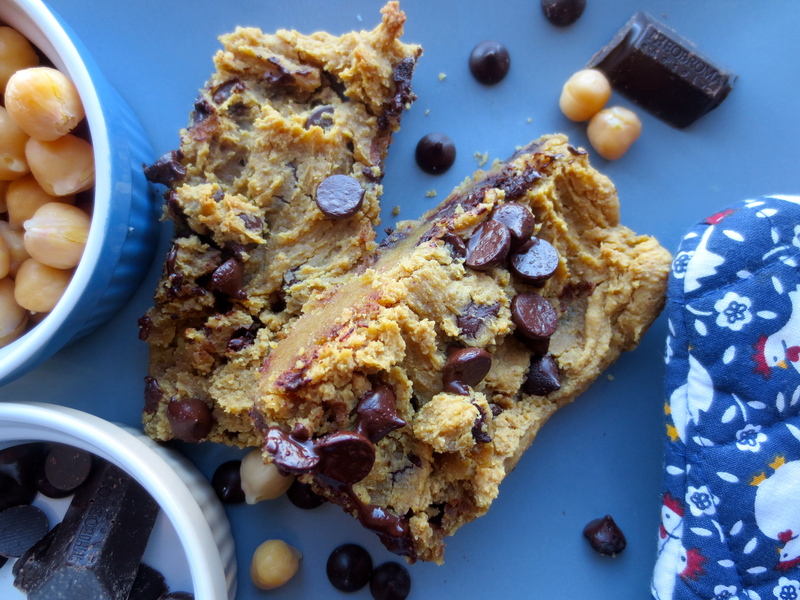 As you know, I like to reinvent the wheel when it comes to desserts, so I’ve smuggled some nutritious ingredients into these decadent bars. This version has less sugar and foregoes butter and eggs, no surprise there 🙂 All these tweaks have yielded deep, dense and buttery-tasting blondies. The pink Himalayan sea salt also balances the flavours out nicely. 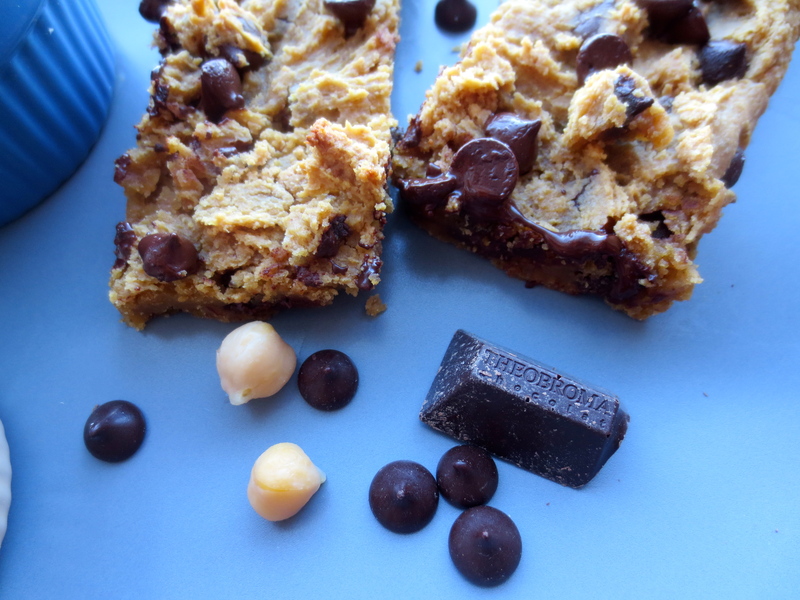 Because these are concocted with nut butter and chickpeas, the protein and fiber contents get boosted, meaning these blondies would definitely win at a blondie showdown. Preheat oven to 350 degrees. Get a head start, eh? Oil an 8-inch square-shaped baking pan with coconut oil. Place chickpeas, peanut butter, sweetener, vanilla extract, sea salt, baking powder and baking soda into your trusty food processor and pulse until completely smooth. Fold in the dark chocolate chips (keep a for sprinkling on top as a decoration). Spread batter evenly into pan and coat with remaining “decorative” chocolate chips. Bake for 30-40 minutes or until knife inserted into dessert’s center comes out clean as a whistle. Sprinkle with sea salt before serving to your loved ones. After a 30-40 minute trip to a hot and sweaty destination (the 350 degree oven). Gooey goodness, these are a crowd pleaser. I promise. I hope you like these as much as I do – these blondies may be the death of me! 😉 I think one of the best parts is: no animals were harmed in the making of this recipe!